We have two great events coming up in late October looking at the history of Chelmsford. On Wednesday 26 October we have a guided walk of the city centre based on John Walker’s fabulous 1591 map (see below if you have never seen this before), and on Saturday 29 October we are hosting Chelmsford Through Time, a pop-up display of historic maps and photographs, with a talk by Dr James Bettley on the post-war development of Chelmsford. You can find details of both of these on our events webpages. In preparation for these events we have been sifting through some of the masses of material we have on Chelmsford history, and I thought I would share here five of my favourite Chelmsford items from our collections, that provide fascination snapshots into the past of our county town. 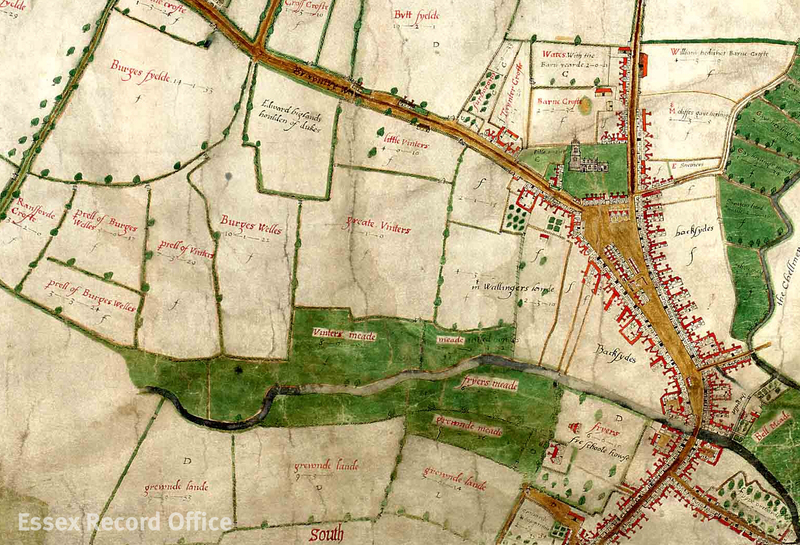 Any round-up of significant documents of Chelmsford’s history must surely start with John Walker’s spectacular map, dating from 1591 (long-time readers of this blog will most like have come across this in some of our previous posts). It shows the town in exquisite detail, with each building individually drawn with its own doors, windows and chimneys. What’s more, a written survey that goes with the map tells us who was living in each of these properties at the time. It’s a very special window into the past that I never get tired of looking through. Jamys Maylette clerke Bachelor of Dyvinyti and p[ar]son of moche Lyes was drawen hanged and quarteryd on the market hyll for high treason on fryday the firste daye of December ao 1542. That is to say, James Mallett, the parson of Great Lees, was hung, drawn and quartered in the market square at Chelmsford for high treason. 1 December that year was a Friday, market day, to ensure maximum witnesses for the gruesome spectacle. Mallett had been a chaplain to Katherine of Aragon, Henry VIII’s first wife whom he divorced in order to marry Anne Boleyn. Mallett had also been rector of Great Leighs for 28 years. His treasonous offence was to comment unfavourably on Henry’s policy of dissolving religious houses. His public execution must surely have been intended as a warning to other clergy not to pass comment on the king’s decisions. 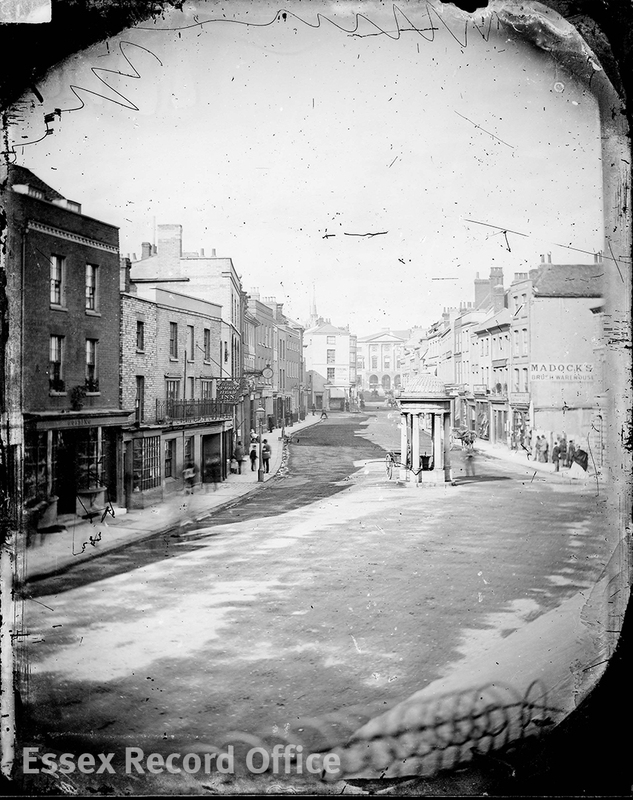 This is one of the earliest surviving photographs of Chelmsford High Street, dating to about 1869. It shows a view looking north up the High Street towards Shire Hall. 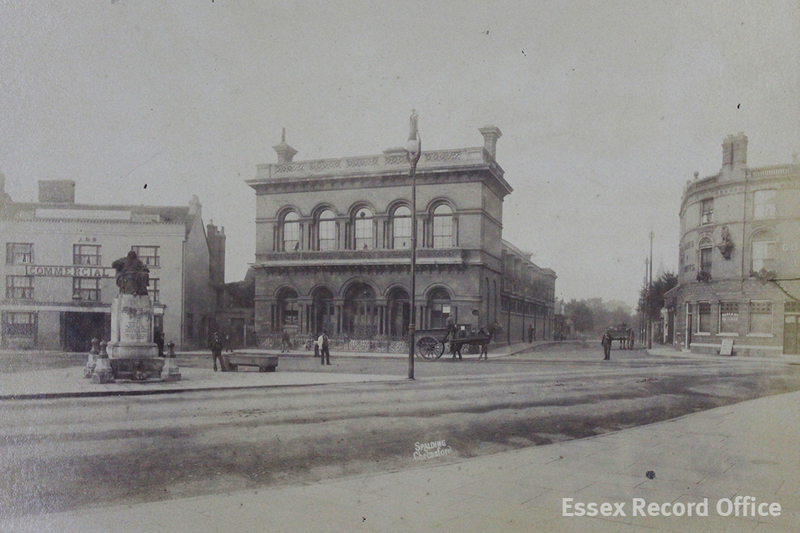 It was taken by Fred Spalding, Chelmsford’s first commercial photographer. Spalding’s son and grandson both became photographers too, and we have about 7,000 of their photographs at the ERO today. This one, like all of Spalding’s early photographs, was taken on a glass plate coated with chemicals; a challenging process to get right, especially in the open air. If I could wave a magic wand over Chelmsford I would love to be able to bring back the Corn Exchange. This neo-Renaissance building was designed by Fred Chancellor in 1857, and sat on Tindal Square (Shire Hall is just out of frame on the right of this photo). It was demolished, along with the whole of the west side of Tindal Street, to make way for the High Chelmer redevelopment in 1969. Join us for Walking with Walker (Wednesday 26 October 2016) or Chelmsford Through Time (Saturday 29 October 2016) to delve deeper into Chelmsford’s history. From the early 17th century, a large portion of the current site of Marks and Spencer was occupied by the county’s House of Correction. By the early 19th century, deteriorating conditions forced the closure of the House. The site was eventually demolished to make way for several new buildings. The site housed various retail establishments until the 1970s when sites 62-66 were absorbed by Marks and Spencer. Houses of Correction were established in the early 17th century, as a place to send vagrants, beggars, and those ‘unwilling to work’. Petty criminals and prostitutes could also find themselves committed to these institutions. The inmates were put to work, but were often not there for very long. A spell in a house of correction may well also have included whipping, especially for those charged with offences such as theft or prostitution. From 1587 the county House of Correction was situated in Coggeshall, but by 1593 the property had deteriorated considerably. The house was sold in 1611 and the county purchased the site of 63-64 Chelmsford High Street. Shortly after, the House of Correction admitted its first prisoners under the watchful guard of Keeper Walter Kellaway. 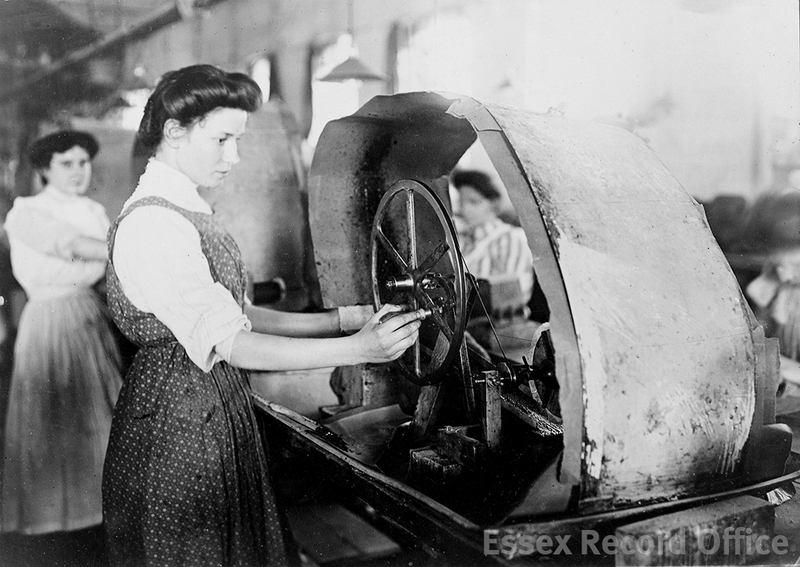 In order to provide suitable work for the prisoners, Kellaway was in charge of a range of equipment including mills to grind wheat and malt, wheels to spin flax and cotton, and billets for pounding hemp. Perhaps anticipating being charged with unruly or troublesome individuals, Kellaway also had chains and manacles. This account list highlights the interesting contrast, inherent in all houses of correction, between punishment and reform. Prisoners from across Essex were admitted to the house on a range of charges, as punishment for perceived lewd, idle, vagrant or disorderly behaviours. 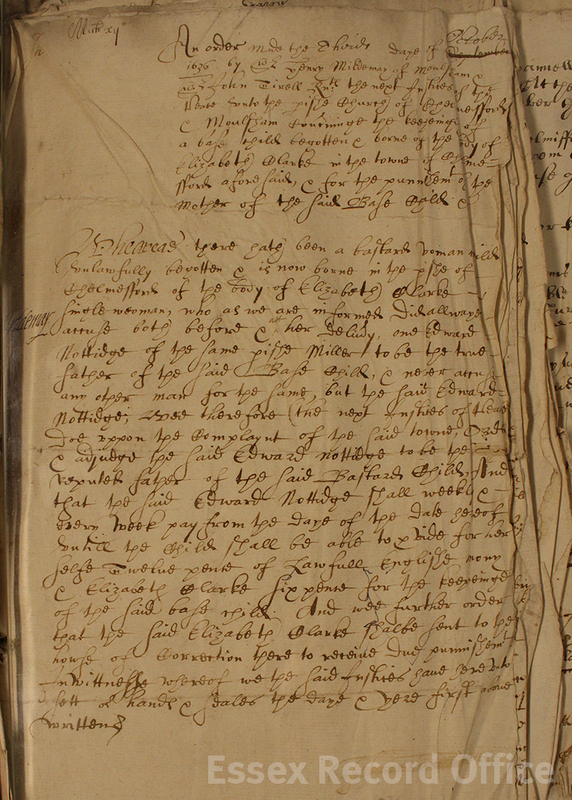 Peter Lake was admitted in 1616 for vagrancy and ‘keeping the company with the wife of John Mayfield as if she were his own wife’, while Susan Larkin was admitted in 1617 for ‘living lewdly and out of all order to the disquiet of her neighbours’. Prisoner escapes were not a common occurrence, although it was a cause of concern given the location of the House of Correction in the High Street. In April 1776 the Chelmsford Chronicle reported that prisoners had escaped from their ground floor dormitory at the House of Correction in the early hours of one morning. In scenes reminiscent of the Shawshank Redemption, prisoners reportedly pulled up the floorboards with a gimlet and tunnelled under the foundations into the yard. Despite the best efforts of the local constabulary, several of the prisoners remained at large three days later. In the mid-18th century the House of Correction expanded to include three brick prison buildings where the more unruly prisoners were detained. The original timber-building, fronting the High Street, continued to be used by the Keeper and his family. Renowned prison reformer John Howard described his visit to the House of Correction in his 1777 book entitled The State of the Prisons in England and Wales. The men and women had separate quarters, with the men’s accommodation located on the ground floor and the women’s, to the same design, located on the floor above. 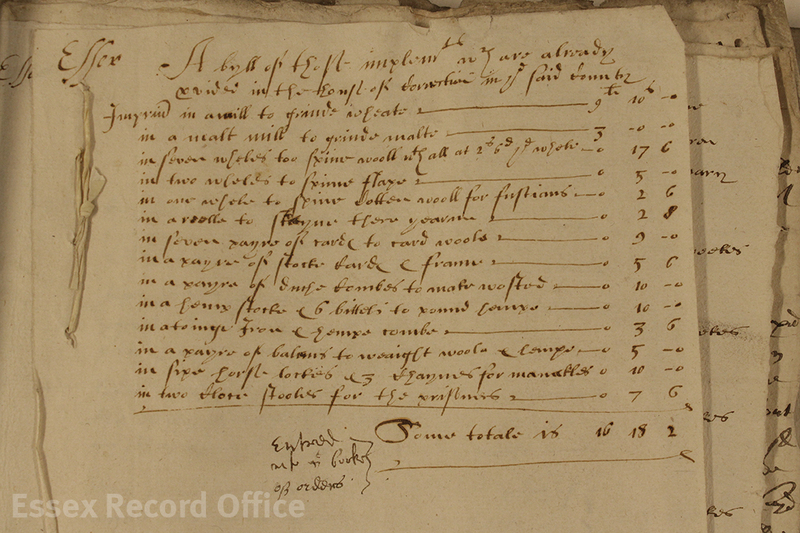 The Keeper, Thomas Ford, informed Howard that prisoners had an allowance of three-pence a day, for which they had a pound and a half of bread, and a quart of small beer. Howard described the courtyard as ‘small and not secure’ resulting in the prisoners always being kept indoors. Furthermore, he described the rooms as ‘offensive’ and generally inadequate. …many and great inconveniences, and is by no means calculated for the purposes to which it is applied. On my visit the 31st July 1803, I found the good old keeper dead; the whole prison [was] filthy and out of repair; in the two upper rooms five women and two children sick on the floor; the straw worn to dust; and in one of the rooms a cartload of rubbish heaped up in a corner. In one of the sick rooms below were four women; in the other room six women and two children, one of the women quite naked, another without a shift, the other four had neither shoe nor stocking…The whole prisoners were coniferous, and almost desperate for water…The prisoners complained of the want of medical attendance, and, if I may judge from the filthiness of the fores and bandages, not without reason. Not surprisingly, Neild was relieved to discover that a new site had recently been purchased adjacent to the new county gaol. The site was completed in 1806, with the prisoners moving in that same year. 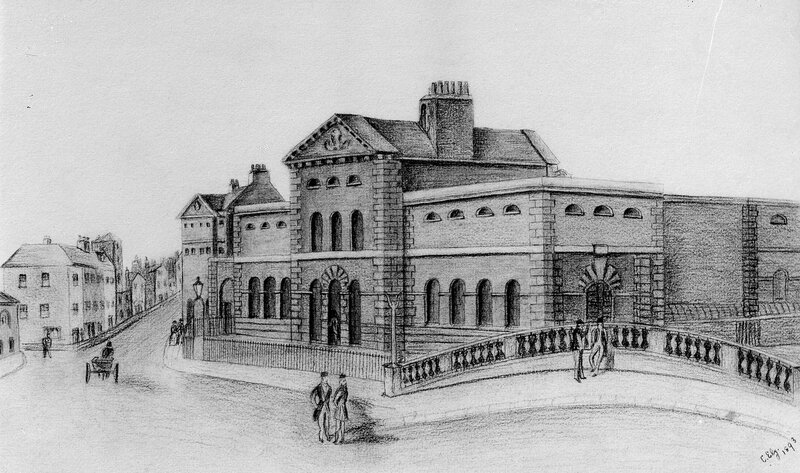 Illustration depicting the new site of the House of Correction and County Gaol. Suggestions as to what to do with the vacant site continued for some time. At one point it was hoped that the site should be redeveloped to accommodate the judges visiting the town for the Assizes although this plan never came to fruition. The property was ultimately sold in 1811 and demolished a year later, making way for two new brick houses. Various retail properties occupied the site over the course of the 19th and 20th century, including a branch of Singer’s Sewing Company (at no. 64). In the 1970s, the individual sites of 62-66 were consolidated by Marks and Spencer, forming one of the largest stores on the high street. 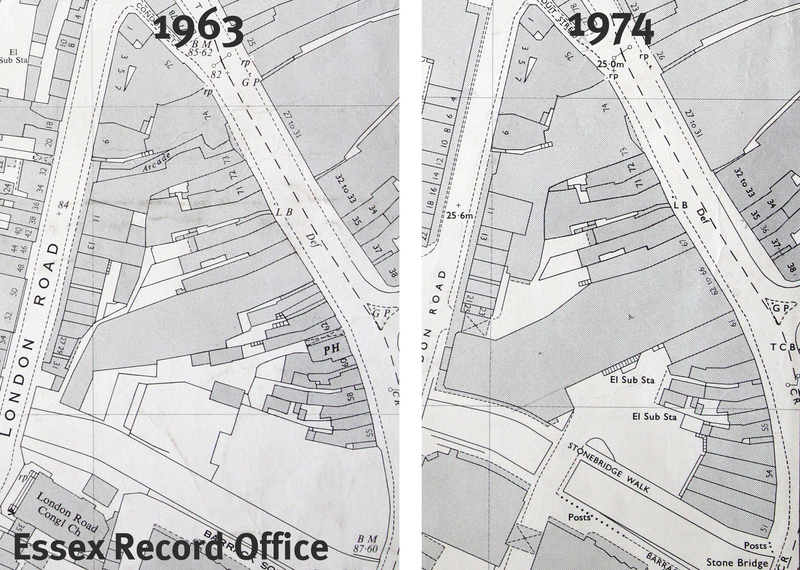 The extract from the 1963 OS map above depicts 62-66 prior to the arrival of Marks and Spencer. There are a number of small properties, packed closely together, dominating the stretch currently occupied by M&S. By 1974, these properties had been consolidated to form one large property. The 1974 OS map presents a significantly cleaned up version of the high street. Marks and Spencer continue to occupy the same spot on the high street today. If you would like to find out more about the House of Correction or any other of the topics covered in this series, Hilda Grieve’s excellent two-volume history of Chelmsford, The Sleepers and the Shadows, is available in the ERO Searchroom, or you can dive straight in to Essex Archives Online and explore our catalogue. For a contemporary account on the state of prisons in the 18th century see John Howard’s, The State of the Prisons in England and Wales. Our county town of Chelmsford may look modern on the surface, but look a little deeper and you will find layer upon layer of history waiting to be discovered. Chelmsford’s history is richly told by maps, photographs and sound and video recordings, as well as documents. Come along to see and hear them for yourself, and for a talk from architectural historian Dr James Bettley on some of the major changes to the town since the Second World War.